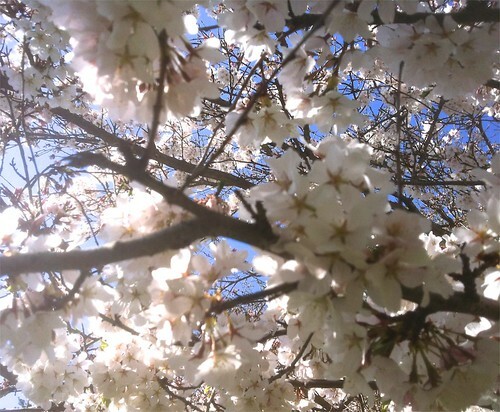 Spring Blossoms, a photo by randubnick on Flickr. Even though the temperature is still on the cool side, things are blooming around here, including this flowering tree in my yard. I took some pictures of it the other day, and tonight I cropped this image out of one of the best. I did a little editing in iPhoto to try to compensate for challenging lighting and a soft focus. Despite these problems, I like the composition, so tonight I also used Painter to create a posterized version, as well as a digital woodcut. So there will be more of this image to come. Magnolia Blossoms Closeup, a photo by randubnick on Flickr. The blossoms on the magnolia tree are opening up. They are so beautiful, and they don't last long. So yesterday I went out to take a few pictures. Tonight I cropped this image out of the best of the batch, focussing on just a few flowers to try to communicate what this beautiful tree looks like. Korean Rhododendron (Digital Woodcut), a photo by randubnick on Flickr. Last week (April 20), I took a picture of this Korean rhododendron, a beautiful shrub that flowers before it leafs out. Tonight I used Painter 12 to apply a woodcut effect to the photo. It was hard to get this right. I didn't want to use enough black on the flowers, but not enough black was showing up on the fence. So I added additional black line to the background, using the "magic wand" tool and working section by section. Those pink blossoms on bare branches only last for a few days, so I am glad to have this image. Another Heart Shaped Box (As of April 27, 2013), a photo by randubnick on Flickr. Sweet Violas (Digital Woodcut), a photo by randubnick on Flickr. 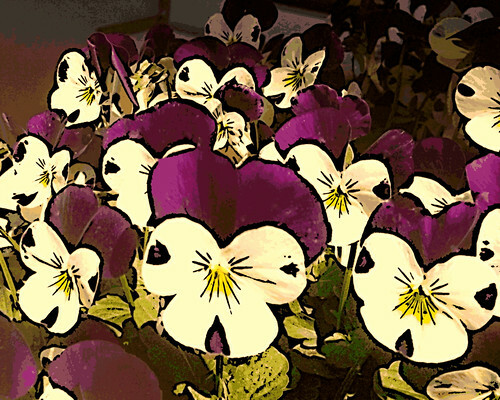 Here is the photo of violas that I posted yesterday, but with Painter's woodcut effect added. It was challenging to get the colors right because the yellow was disappearing. I did some adjustments in iPhoto as well, shifting the colors a bit and doing some cleaning up with the retouch tool. Sweet Violas, a photo by randubnick on Flickr. Today I was running a couple of quick errands when I saw these sweet violas in a planter on the sidewalk in front of a local restaurant. Violas look like pansies, just smaller, and like pansies, they always make me smile -- or perhaps I should say, smile back. So I stopped and took some pictures with my iPhone camera. I cropped this image out of the best of the photos. I hope these little violas make you smile too. Buds on Magnolia (Digital Woodcut), a photo by randubnick on Flickr. Here is my photo of magnolia buds again, this time with Painter 12's woodcut effect applied. (The original version is posted here on April 21.) When I use the woodcut effect, I always have to do a lot of fiddling with the controls to get the right amount of black line. But this time I was lucky. The woodcut effect emphasizes the curved lines of the magnolia tree as well as the straight lines of the siding in the background. 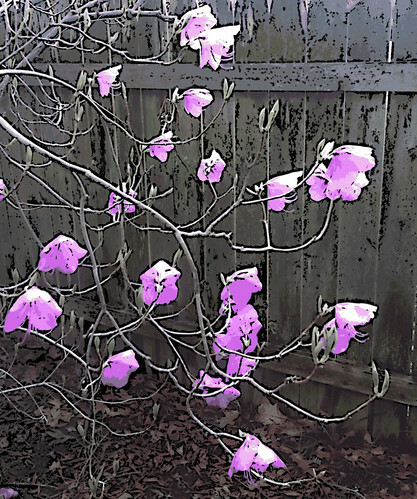 Buds on Magnolia (Posterized Photo), a photo by randubnick on Flickr. 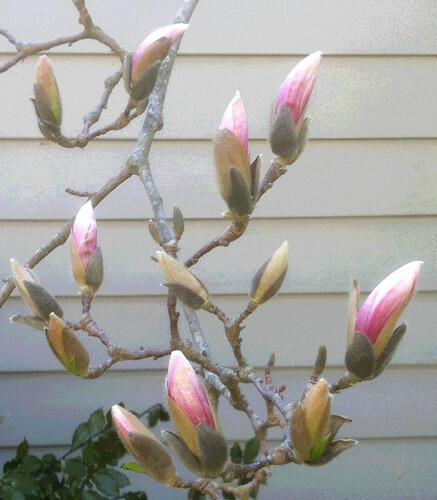 Tonight I used Painter 12 to add a posterized effect to the photo of magnolia buds that I published here on April 21. I also created a version with a woodcut effect, and I plan to post it here tomorrow. Earth Rising, a photo by randubnick on Flickr. I was thinking about Earth Day tonight when I made this image with the Brushes app on my iPhone. This little fantasy of earth rising is inspired by photos of the earth seen from space. From an Apollo mission in the 1970s, we got our first view of the earth from space and saw it as a'big blue marble'. Thanks to the NASA, we saw beautiful pictures of earth taken from the surface of the moon. But as beautiful as these images are, seeing the Earth rise from another planet is not the view I would wish for future generations. The best views of Earth are the close-ups. Buds on Magnolia Tree, a photo by randubnick on Flickr. This morning I could see from my window that the magnolia tree is almost ready to bloom. 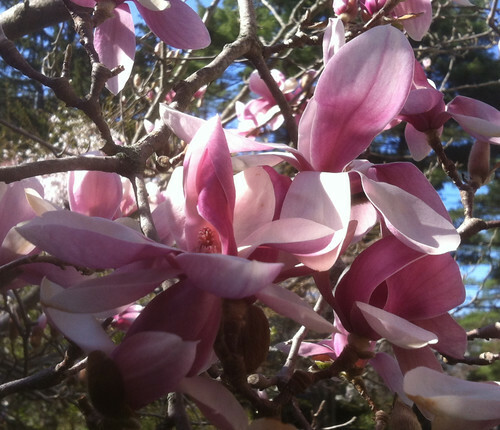 Although I always wait for the blossoms to appear, magnolia buds are beautiful for their own sake. They will open when the conditions are right. I think that will happen soon, so this afternoon I went outside and took some pictures. Tonight I cropped this image out of the best of the photos. Korean Rhododendron by the Fence, a photo by randubnick on Flickr. 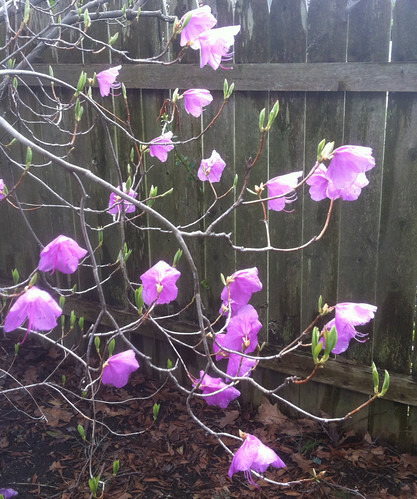 Korean Rhododendron is a favorite of mine, with bright pink blossoms that appear in early spring. It blossoms before it leafs out, so you see pink blossoms on bare branches. Korean Rhododendron is growing right in my back yard, and for at least a week, I have been admiring it. I like the way the blossoms look against the fence. I have been meaning to take a picture, but I seem to be rushing in or rushing out, right past these flowers, on my way to doing something that seems more important than taking a picture. (Thinking that way is a good sign that I am losing perspective about really matters. )Today I saw leaves beginning to emerge, so I finally went out back and photographed those beautiful pink flowers. Tonight I cropped this image out of the best photo. Moss and Tree Trunks at Bradley Palmer, a photo by randubnick on Flickr. Last weekend, after a trip to the vet, we stopped at Bradley Palmer (in Topsfield, MA) to walk the dog. We followed a trail beside the water, where I saw these moss covered tree trunks. I liked this quiet scene, so I took a picture. Who knew that the week ahead would be anything but peaceful, here in Massachusetts. The events of the week cannot be undone. But peace has returned tonight, and so I am posting this. Pink Flowers in Blue Vase (Digital Pastel Day 7), a photo by randubnick on Flickr. Tonight I worked on this little digital drawing for the 7th and (probably) final time. This is done with Painter's digital pastel and a little bit of posterizing effect here and there. I have been thinking about adding a pattern to the purple part of the background, but wanted something subtle. So I put up a grid and drew vertical lines with only a little bit of color difference. I tried out a few lines and liked the way it looked, so I kept going. I also did a little work on the vase, and finally added some outline to the leaves. No doubt I will notice little mistakes to fix, but this is basically done. I like these funny little flowers, and I might use this image to make cards on Zazzle. Pink Flowers in Blue Vase (Digital Pastel Day 6), a photo by randubnick on Flickr. Today I returned to this little digital still life that I have been working on. 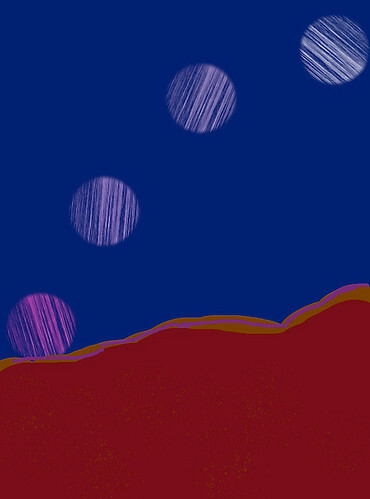 (I am drawing on the computer with Painter 12's digital pastel, using a mouse to control the brush strokes.) This is the sixth drawing session for this image (but not on consecutive days). Today I added some detail to the flowers and the table, and spent the rest of the time working on the shadow under the vase, trying to get the elipsis right. Also fiddled around with the sides of the vase. I think this is just about done, though I know the minute I write that down, I will see more things to fix. Zakim Bridge at Night (Posterized), a photo by randubnick on Flickr. Tonight we drove into Boston to see "The Book of Mormon". We got tickets some weeks back, but things looked anywhere from iffy to impossible this morning. But by mid-afternoon it was clear that the performance was on and and the streets weren't blocked off and parking was possible, so we decided to go. We listened to radio coverage of yesterday's bombing all the way there. But once we got to Boston, it felt good to be there. There were lots of people in marathon jackets -- on the street, in restaurants, and in the theater. Of course The Book of Mormon was great and at the end, one of the actors thanked the audience for coming out tonight. 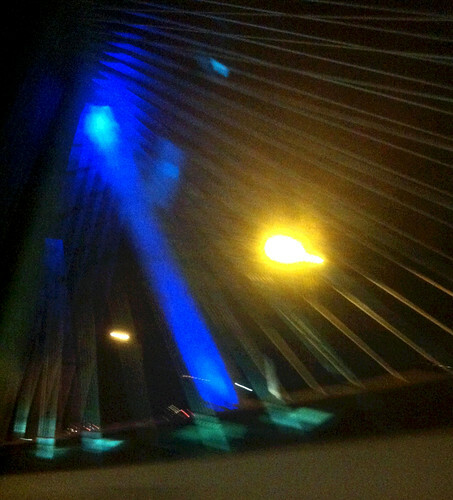 I had only taken one picture the whole night, but on the way home, we drove over the Zakim Bridge. It is so beautiful at night, lit up in blue, so I pulled out my iPhone and took two quick pictures. When I got home, I posterized one of the photos and then cropped it to get this image. Sad Day on Boyleston Street (Digital Woodcut), a photo by randubnick on Flickr. This image began back in the winter of 2006 when I was in a car heading down Boyleston street on a slushy day. From the passenger seat, I got a great shot of the Boston Public Library and the Hancock. Because this is so close to the finish line for the Boston Marathon, I posted the image on Patriot's Day in April of 2006. Tonight I made a new version of the image that seems to be more suited to the sadness that suddenly came over Boston this afternoon. 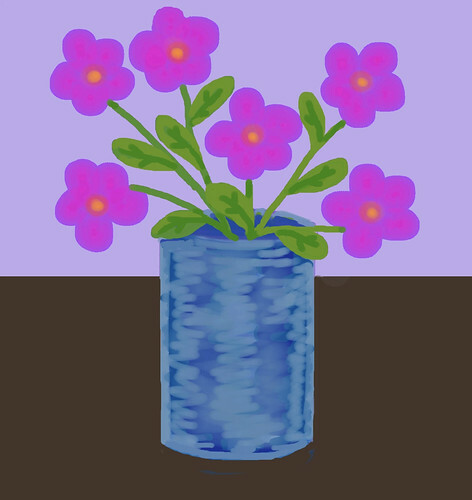 Pink Flowers in Blue Vase (Digital Pastel Day 5), a photo by randubnick on Flickr. This is a work-in-progress, a still life that I started five days ago using Painter 12's digital pastel. I used a late afternoon break in the action to work on this drawing. First I made a few adjustments to the sides and top of the vase, still trying to make sure the ellipse is right. Then I worked on the foreground. I made it lighter so I could add shadows and some lines to suggest wood grain. Then I cropped the image. Still more to do. . . . Pink Flowers in Blue Vase (Digital Pastel Day 4), a photo by randubnick on Flickr. Today I took a break and worked on this little digital drawing that I started four days ago. I have been thinking about adding a second kind of flower, so I finally did. That meant more stems and leaves, too. I added a little detail to the foliage and did a little bit of clean-up to the vase. I still have work to do on the vase and the background. More to come. Pink Flowers in Blue Vase (Digital Pastel Day 3), a photo by randubnick on Flickr. This afternoon I worked for a little while on this digital sketch that I started three days ago. I am using Painter 12's digital pastel to create this little still life. Today I worked on the vase again, revising the sides and the shape of ellipse at the top. (I am working from my imagination, but even imaginary ellipses have to be right.) I also added some definition to the flowers, and changed the proportion of purple and brown areas in the background to change the horizon line. Still more to do, but I am more optimistic about how this digital sketch will turn out. 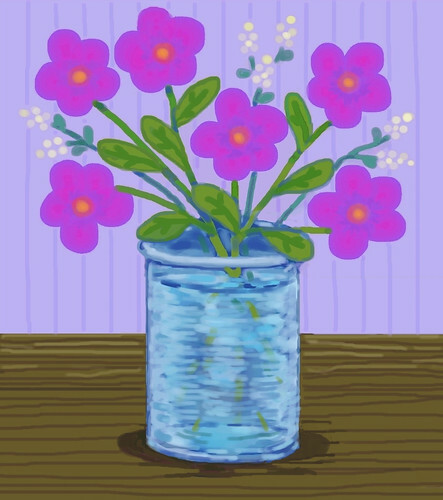 Pink Flowers in Blue Vase (Digital Pastel Day 2), a photo by randubnick on Flickr. This afternoon I took a break and worked on this digital sketch that I started yesterday in Painter 12, using digital pastel. Apart from a few brush strokes on the stems and leaves, almost all the work I did today was on the blue vase. There is still plenty to do! To be continued. . . . 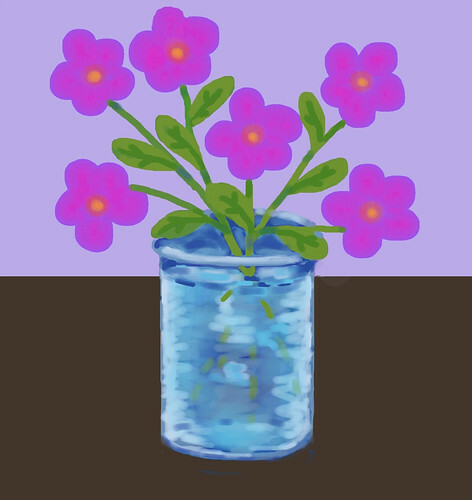 Pink Flowers in Blue Vase (Digital Pastel Sketch Day 1), a photo by randubnick on Flickr. Tonight I didn't have much time so I thought I would do a quick sketch in Painter 12 using digital pastel. This took longer than I had hoped. I worked on it for almost an hour but then had to stop. I like the pink flowers but the rest of it needs work, so I plan to keep going with it tomorrow. 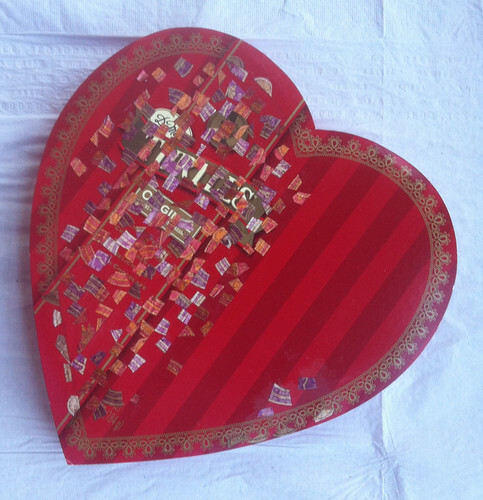 Another Heart Shaped Box (As of April 9, 2013), a photo by randubnick on Flickr. Yellow Crocus (Posterized Photo), a photo by randubnick on Flickr. 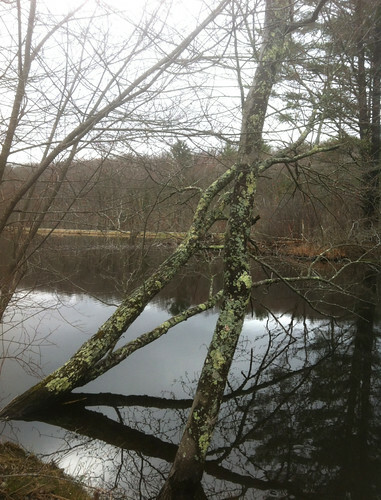 Yesterday was a cold spring day, but we took a short walk at the Cummings Center Pond, here in Beverly, MA. 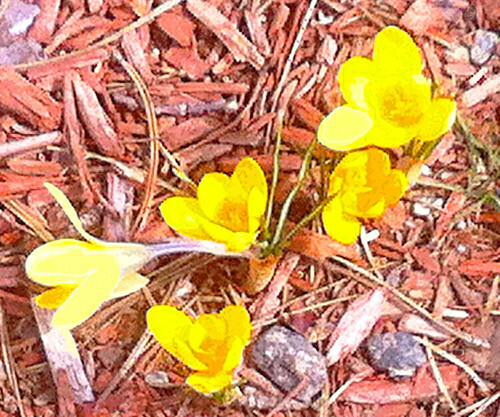 I saw the first yellow crocus of the season, so I took some quick pictures. Tonight I used Painter 12 to edit and posterize this one. Trees and Colorado Mountains (Revision as of April 7, 2013), a photo by randubnick on Flickr. I have been working on finishing up a drawing that I recently found in an old sketchbook (posted here March 29.) 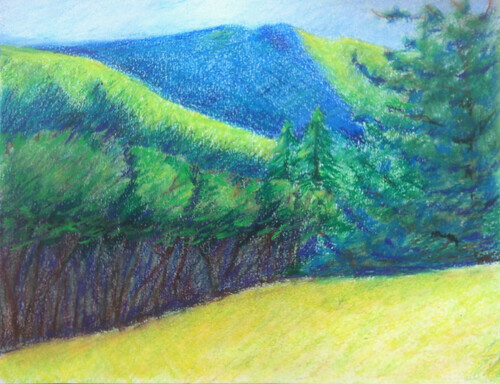 This is an oil pastel drawing of the Colorado mountains, possibly drawn from observation during a trip to my home state. I have been adding detail and definition, and I think that part of the process is complete. But I want to try to maintain the things that I liked about the sketch as it looked when I found it, especially the colors. Today I concentrated on lightening some of the colors to make them closer to the original version, especially the blues and bright yellow-greens on the mountains, the yellow field in the foreground. There may be some minor revisions (I always see mistakes at this point) but I think this is basically done. Trees and Colorado Mountains (Revision as of April 6, 2013), a photo by randubnick on Flickr. This morning I did some more work on this project, an oil pastel drawing that I recently came across in an old sketchbook and am trying to finish. This morning I added texture to the field in the foreground. I think that I have added enough detail and don't plan to do more. But I thought about the sketch as it looked when I found it and made some changes to make sure I keep what I had liked best in the original.I modified the color of the mountains, going for a lighter turquoise color toward the top, and I made the shapes of the trees a bit looser. I also added some bits of red and pink just to balance out all the green. I think this is close to finished, but I think I still want to modify some of the colors. 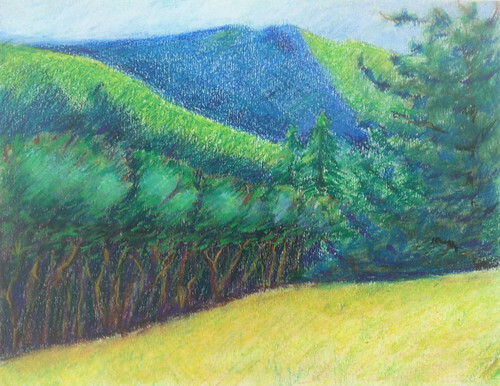 I think I will add more yellow to the foreground and to the light green on the mountains. Almost there. 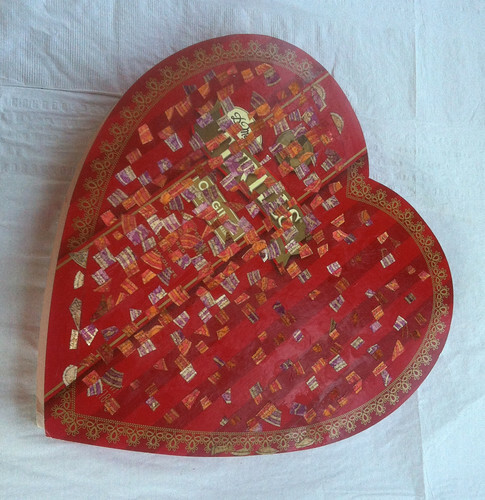 Another Heart Shaped Box (As of April 4, 2013), a photo by randubnick on Flickr. 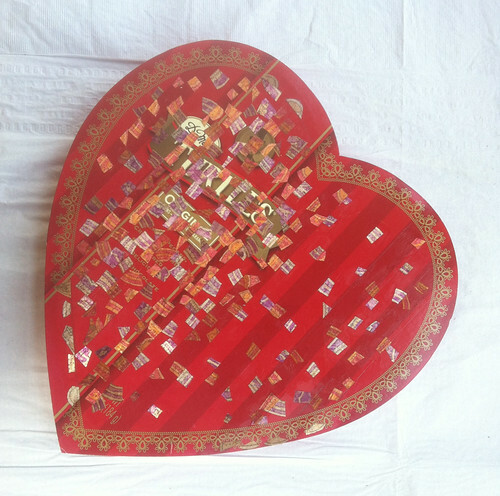 I am making another heart-shaped box, collaged with pieces of printed metallic ribbon. (If you want to see my first heart-shaped box, go to www.flickr.com/photos/randiart/sets/72157632769935420/ ). Yesterday I went to the studio and worked on this project for a while. I am still pasting down pieces of ribbon to establish where the stripes will be (in purple and in orange). It is very easy to make a mistake with stripes, but a mistake with stripes is very hard to fix. I am already worrying about running out of ribbon, and I am keeping that in mind as I decide where to put each piece. The stripes are becoming a little more apparent as the candy logo slowly disappears. Honeymoon in Kansas City, MO (Digitally Modified and Posterized Photo), a photo by randubnick on Flickr. 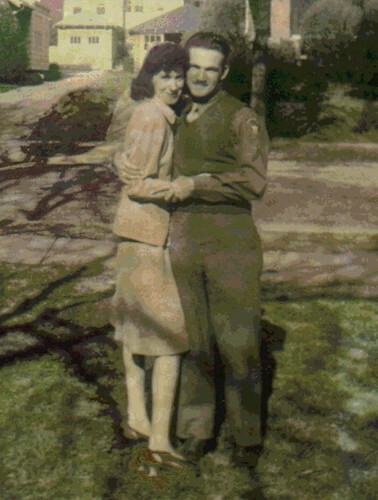 My folks were married on April 4, 1943 (wow, 70 years ago) so today I was looking through my mom's album. My mother kept an album that starts with pictures on the day she met my dad, through their wedding a few weeks later, their honeymoon trip to NYC, and then photos that my dad sent back while he was overseas during WWII and photos of my mom's life in Pueblo until he returned. She kept all the photos in order, with captions and information written longhand in white ink on the black album paper. Today I found a snapshot that I liked, taken in Kansas City, Missouri. My mom wrote that they left Pueblo on April 18 on the Santa Fe Railroad, headed for Brooklyn, NY, but made a stop in Kansas City and had breakfast with friends. (One of those friends probably took this picture.) I liked the fact that this was taken in Kansas City, MO because years later we lived in Kansas (Emporia and Lawrence) and often visited Kansas City (both KS and MO sides). Anyway. The snapshot itself is about 3 x 4 inches (if that). I liked the pose and the lighting. The composition showed a lot of background, so the image of my parents was very small indeed (maybe an inch and a quarter). But I liked the photo and decided to do something with it. I scanned the image into the computer, and then used Painter 12 to increase the size and resolution of the image. 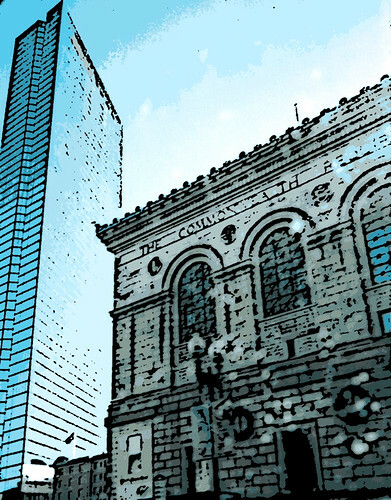 Then I added color overlays and selective posterizing. My first crop showed more of the background, which I had fun colorizing. But I cropped a lot of it out for this version, to give center stage to the newlyweds. Trees and Colorado Mountains (Revised as of April 3, 2013), a photo by randubnick on Flickr. 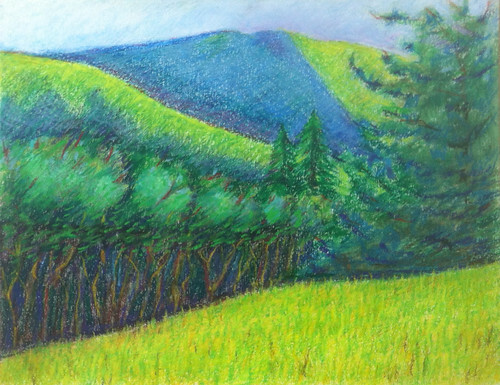 I have been revising this oil pastel drawing that I came across in one of my old sketchbooks. This morning I worked on the line of shrubs, adding lights and darks to the underbrush. I also changed the color of the foliage a bit. I also started to tone down some of the sharp yellow-green areas. I think this looks better, but I still have a bit more to do. 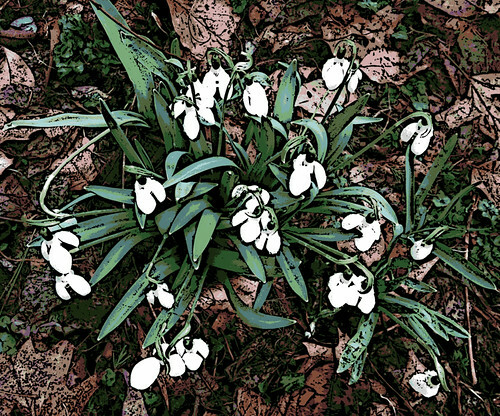 Snowdrops (Digital Woodcut), a photo by randubnick on Flickr. Yesterday we had sudden rainstorms in the afternoon, but we decided to try for a walk at Long Hill Gardens (here in Beverly, MA) and by the time we got there, the rain had stopped. I saw some snowdrops in bloom. I liked the way they looked, emerging among the mud and dead leaves, so I took some pictures. Tonight I used Painter 12 to apply a woodcut effect to this one, fiddling with the controls to get the right amount of black to land in the right places. Trees and Colorado Mountains (Revised as of March 31, 2013), a photo by randubnick on Flickr. 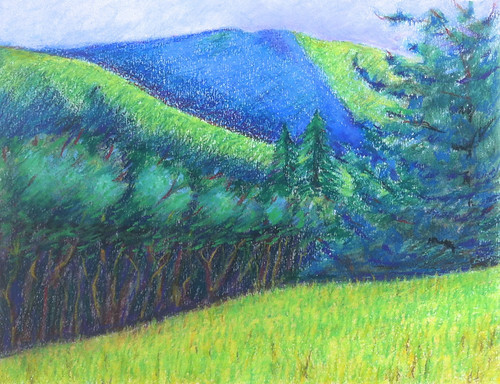 This image is an oil pastel drawing that I recently came across in one of my old sketchbooks. This is probably from the mid- to late-1980s, though there is no date. Even though I liked the sketch, it didn't look finished, so I decided to do some more work on it. I have been adding shadows and adjusting some of the shapes. But there is more to do. To be continued. . . .